When it comes to Smart Phone and iPad games, Angry Birds and Cut The Rope have to be two of the most captivating. Building a loyal following both are worthy of the closer look that we present here. 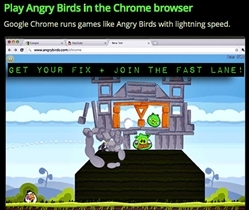 Angry Birds is a puzzle-based video game that was developed by Rovio Mobile out of Finland. The game involves using a slingshot to launch birds at pigs located on or inside different structures, with the end goal being to destroy all the pigs on the field. Inspiration for the game came from simple sketches of wingless birds, and it was released for the Apple iOS in December of 2009. 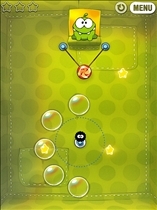 Cut The Rope is also a puzzle-based video game with a physics slant. Developed for the iOS by ZeptoLab out of Russia in 2010, the game is published by Chillingo, and utilizes the Crystal social networking service. Angry Birds require players to control a flock of birds, all of which aim to retrieve eggs stolen by evil pigs. Every level has the pigs hiding in structures constructed out of different materials. Players will have to eliminate all the pigs in each level, using a bird-launching slingshot to score points by either hitting pigs directly or damaging the structures where they are hidden, causing them to collapse and killing the pigs. As players progress through the game, more effective weapons become available and can be used against the pigs, such as rocks and crates that explode. In Cut The Rope, the goal is to maneuver candy into a cartoon monster’s mouth and to pick up any number from one to three stars in every level by touching them with the candy. The candy is suspended by one or more ropes that can be cut with a finger, or can be manipulated by using bellows and other objects. Angry Birds was first released for the Apple iOS in December of 2009, and has since sold more than 12 million copies. The massive popularity of the game inspired Rovio Mobile to design other touchscreen-based smart phone versions of the game, including versions for the Android and the Symbian 3. The company also continues to support the game with free updates that provide additional content, and there has even been a stand-alone version of the game released for the holidays. At present, more than 50 million copies of the game have been downloaded across various platforms. Cut The Rope was released on October 5, 2010, when it was made available in an iPhone version and HD versions for the iPad. Only nine days after the game was released, Cut The Rope sold more than one million copies, making it the fastest-selling iOS game to hit the million mark. As of November 2010, the game had sold more than three million copies. Which game is more fun?